The Dahlia Anemone Urticina felina is one of the better known of the Urticina anemones. Though that's not unexpected because of its attractive appearance. It is surprising, however, considering its natural habitat. it has a small natural range, found only along the coasts of the British Isles in northern European. This cold-water anemone also lives in some very deep water, at depths as much as 656 feet (200 m). They are found burrowed into crevices and cracks in subtidal areas where there is strong wave action. They are moderate in size, reaching up to 6” (15 cm) in diameter, but their tentacles, numbering up to as many as 160, have a blotchy coloration that can help them blend in with their surroundings. The tentacles can have a variety of color combinations, but are usually just a dark and pale version of one or two colors. Some species of Urticina anemones have very festive colors, and at first glance they look very similar to one another. The Dahlia Anemone Urticina felina is one of these. A couple of its similar looking relatives are the Painted Anemone Urticina grebelnyi and the Christmas Anemone Urticina crassicornis. Although these pretty Urticina anemones can look quite similar to each other, each one has its own unique characteristic to identify it by. The Dahlia Anemone, compared to these other Urticina anemones, has a very sticky column. It usually has particles of shells and rocks stuck to it. This debris, along with the column's natural grays and blotches, helps it to camouflage into the rock. When caring for the Dahlia Anemone, use similar husbandry as for other cold water anemones. Because it requires a cold- water reef, it's a good idea to Invest in a chiller before you obtain one of these guys. Like all anemones, they use their venomous cells, or nematocyst found in their tentacles, to sting and deflect any possible threats or attacks. But they mostly utilize them for stunning and capturing prey. Some predators of this anemone can be certain nudibranchs, sea stars, and snails. The Dahlia Anemone Urticina felina was described by Linnaeus in 1761. It is only found on the coasts of the British Isles in northern European waters. This anemone is not on the IUCN Red List for endangered species. Some other common names they are known by are Northern Red Anemone and Red and White Urticina felina. The Urticina genus is a member of the Aiptasiidae family and currently contains 12 species. General common names the various Urticina anemones are known by include the Mottled Anemone, Painted Urticina, Northern Red Anemone, Painted Tealia, Red and Green Anemone, Northern Red Anemone, Dahlia anemone, and Thick-petaled rose anemone. These common names are often used interchangeably, but there is one generally accepted common name for each species. Dahlia Anemones are found in colder waters down to 656 feet (200 m) deep. They are usually burrowed into the crevices of rocks in subtidal areas near shores that have a strong wave action. The smaller ones occur at high, mid-tide levels. They are found singly but are also found in mass, forming what almost looks like a dense carpet. They can also be found in estuaries if the bottom has enough hard surfaces to attach to. This cold water anemone feasts on shrimp, crabs, mussels and small fishes with tentacles that can number up to 160. They use their venomous cells or nematocyst found in their tentacles to sting and deflect any possible threats or attacks but mostly utilize them for stunning and capturing prey. They have been known to bury themselves in the sand with only the tentacles showing to trap crabs. Some predators can be certain nudibranchs, sea stars and snails. The Dahlia Anemone is a moderately large animal. It can grow up to 6” (15 cm) in diameter and its oral disk can be crowned with as many as 160 short (up to 2 cm) tentacles. In the wild, these anemones can live between 60 to 80 years. The Dahlia Anemone has a very sticky pedal column, usually with particles of shells and rocks stuck to it. The pedal column is usually red colored with greenish gray blotches and gray warts. At the top of the column is an oral disc with an opening, or mouth, in the center. The U. felina take food in and expel waste through this same opening. The mouth should be closed and tight. It will open when hungry, having an oval look. A gaping mouth is a warning signal that the anemone is not doing too well. Its tentacles are short, stout, and well spaced in multiples of 10, with the inner-most row surrounding the mouth. It is not so much the color of the anemone that identifies it, but the pattern on the animal. The tentacles have a variety of color combinations that are dark and pale versions of one or two colors. The colors can be purple, blue, yellow, red, pink, or orange, and there are little bands of gray, brown, pale pink, and white in-between those colors. Its very sticky column along with its colorations, are the main characteristics which this anemone apart from other Urticina species. However, it is not so much the color of the anemone that identifies it, but the pattern on this animal. Dahlia Anemones also have a sticky 'foot' which they use to adhere to rock crevices and cracks. They can also use this foot to move around if conditions are not ideal. Another way they can move is by inflating themselves, detaching from the surface, and then rolling along with any current. They will move to avoid predators like starfish, but in the aquarium they will primarily move if they are unhappy with the water conditions or the food. Sea Anemones Life Cycles: Dahlia Anemones can grow up to 6” (15 cm) in diameter. It is unknown how long they live, in fact some anemones can be hundreds of years old in the wild, and in captivity have been known to last 80 years or more. Size of organism - inches: 6.0 inches (15.24 cm) - This anemone can grow up to 6” (15 cm) in diameter. 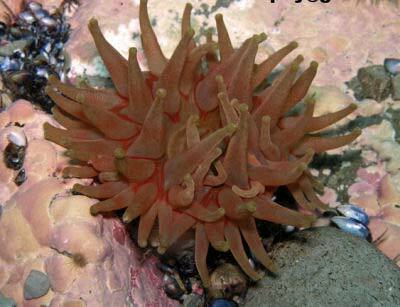 Lifespan: 80 years - The Urticina anemones can live from 60 to 80 years in the wild, probably less in captivity. The Dahlia Anemone can be moderate to care for because they do have cold water needs. Putting an anemone in a new tank will result in failure. As with most anemones, the tank should be at least 9 months old and stable before adding your new U. felina. When selecting a U. felina, make sure the color is good, their mouth is not gaping open, and their foot and tentacles are sticky to the touch. They should also be attached to something. Make sure there is no damage to the foot area, as this is often a result of pulling the anemone off its surface. To transfer a Dahlia Anemone from another aquarium, use a very thin blunt item like a credit card to get under the foot. Gently wiggle it under the foot, slowly nudging it away from the glass. If its attached to a rock, ideally you can simply purchase the rock as well, because these guys can stick hard and It may possibly be damaged if removed. If you cannot purchase the rock, while under water, directing water at it or wiggling the rock gently upside down while tickling the foot can work. The Dahlia Anemone is a carnivore. In nature, they use their tentacles to sting and capture prey, often careless fish and invertebrates that bump into them. In captivity hand feed your U. felina chopped silversides, shrimp, krill, and mussels, fresh chopped fish (from your grocery store), as well as frozen carnivore preparations. The metabolism of the Dahlia Anemone is not as fast as warmer water anemones. They are cooler water creatures, so usually only need to be fed once a week or twice a month. Feeding Frequency: Weekly - Feed them once a week to twice a month. Water changes of 10% bi-monthly or 20% a month are typical. Monitor your water quality for your particular situation and adjust your water changes accordingly. Waste production created by your anemone can be calculated in inches. Basically, every inch of anemone is equal to an inch of fish, so an average-sized Dahlia Anemone produces a bio-load equivalent to that of about two 3" fish. The Dahlia Anemone can readily be kept in a nano reef of just 20-gallons or more. The typical reef environment is needed, but it must be a cold water reef. They need live rock or some other solid material they can attach to. You can even use submersed bio-balls. Calcium doesn't need to be as high in cold water, so providing reef rock for calcium is actually not necessary although it is needed to keep the alkalinity and pH stable. Bacterial formations take a very long time in cooler water, so the most important thing for the nano reef is mechanical and chemical filtration. Provide a good skimmer and use filter floss and chemical additives, such Chemi-Pure, GFO, and carbon in the filter to help keep the water clean. Chemi-Pure helps remove heavy metals, copper, phenol, ammonia and other nitrogenous waste. It also helps keep the pH at a consistently safe range. Granular ferric oxide, or GFO, helps with phosphate control. Water changes when things get out of normal parameters, so the addition of a refugium with a deep sand bed can help maintain normal parameters, too. They need a moderate to high-surge water movement and average lighting. The light emitted from LED and t5 fixtures puts off less heat, which is essential with a cold water tank. The temperature can be between 59 to 72° F (15 - 22° C), but whatever temperature you choose, keep it stable as fluctuations can be stressful to the anemone. A chiller will be needed, but this allows you to have both inter-tidal and sub-tidal animals. Acrylic tanks are best for insulating against temperature fluctuations, each 1/2" will give a thermal barrier of 5° F. Be sure to have all of your pumps covered, most good quality pumps have guards on them. Water Movement: Moderate - Moderate to high surge. The Dahlia Anemone is considered semi-aggressive because they can be mobile and may split once adjusted. It has often been suggested to not put anemones in a reef environment since corals cannot move away from the stinging tentacles. Most of the cold water anemones will stay still if their needs are met. They will move, however, if your lighting is not good or the water quality is not to their liking. Similar to others in their genus, it may split often once settled. After splitting, however, they will tolerate their own “clones” and sometimes their own species. All anemones in the tank need to have their own space, otherwise there can be a “chemical” warfare between species. This will usually cause one to not eat, shrink and eventually die. Having excellent filtration and a large tank will usually allow 2 anemones at opposite ends to thrive. You can also build a natural blockade to help prevent them from wandering into each others “space”. Dahlia Anemones are best kept in a species specific display. Keeping corals in the tank can be a risky thing to do because these anemones may multiply rather quickly once adjusted. If attempting to add cold water corals, allow the anemones to settle first. Once they are in place, you can then try placing a coral away from them. However, there may eventually be detrimental affects on any other corals or anemones. If the tank is very large, keeping larger cold water fish should be fine. Problems occur when keeping small gobies, blennies or other small cold water fish. These can easily become dinner if they wander into the very sticky (more sticky than typical) tentacles of this anemone. Same species - conspecifics: Sometimes - They will tolerate their own offspring. Mushroom Anemones - Corallimorphs: Threat - This anemone will quickly multiply and sting tankmates. Leather Corals: Threat - This anemone will quickly multiply and sting tankmates. Zoanthids - Button Polyps, Sea Mats: Threat - This anemone will quickly multiply and sting tankmates. Sponges, Tunicates: Threat - This anemone will quickly multiply and sting tankmates. Shrimps, Crabs, Snails: Monitor - Only cold water species and commensal animals. Stony Corals: Threat - is aggressive - This anemone will quickly multiply and sting tankmates. Soft Corals: Threat - is aggressive - This anemone will quickly multiply and sting tankmates. The Dahlia Anemone will divide in captivity. There is no information on the propagation of cold water anemones, however, but it may be just like other anemones. Similar to other cold water anemones, they reproduce by fission or external fertilization of egg and sperm. When they spawn, they produce larvae that will float away, and eventually finding a spot to land. They then attach and develop a pedal disk that grows into a new anemone. Dahlia Anemones are pretty durable once they settle in. Problems are pretty minimal unless your lighting, water movement, feeding and water quality are low. Then your anemone will detach to look for “better conditions.” In general, if your anemone moves, it is not happy. Make sure your lighting and water quality is good, and that the food you are offering is to their liking. Some predators include certain nudibranchs, sea stars, and snails. The Dahlia Anemone is generally unavailable to aquarists through local retailers, though it can sometimes be found online. I was able to find one of these at a lfs and was so happy I did they are so beautiful. Best anemone for a micro tank since they stay small and don't need a heater. It is very fast eater I have never seen an anemone's head move so fast from one side to the other to eat. The tentacles are very sticky and I don't think a clown could ever use one. I have a lot of small shrimp in my tank and the tentacles are so sticky that if their antenna even touch them he will quickly turn his head and the shrimp is doomed. Also they are so fast when you add some pods in the tank his little ten tentacle tips just pick them of one by one the coolest thing ever to watch. The colors are so intense it is beautiful. If you get a chance to get one do so and set up a species only 5 gallon tank with maybe a kenya tree or some paly's do not pass up the chance to own one of these guys. You can add one in a nano or large tank to just make sure the placement is right because if he goes on the move he will not just sting but eat any corals that stick to his superglue tentacles. A must have for the serious anemone enthusiast but a very rare one to find in certain parts of the world if you live in england you can probably just find one at the lagoons.